When I started to think about how to present my WID portfolio, it’s not surprising that I got stuck pretty quickly given the many powerful ideas we encountered in our readings and discussions. Creating a few pages of notes of key concepts in Bean and other readings helped, but it was only when I reminded myself of a “pre-writing” tool I encourage students in all my classes that was able to start sorting out my ideas. Within minutes a messy but rich mind-map emerged, centered around the overarching goals of all of my work as a teacher: “student engagement, empowerment, and academic success.” Branching out from these central values was (in a not necessarily logical manner) a mess of concepts and strategies that seem, to me to be key for helping students gain confidence and succeed (not necessarily in that order): student-centredness, constructivism, differentiated learning/Universal design for Learning, portfolios, relevance, beautiful problems, (learning) community, genre and discourse awareness, rhetorical flexibility and so on. 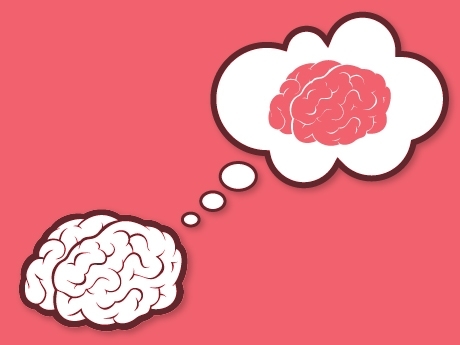 But as I’ve often seen when observing students going through this process, I found my central idea in one corner of the mind-map: metacognition and its role in the learning process. In my English 101: Effective Reading and Writing (ERW) course, I try to promote this idea through two main assignments. 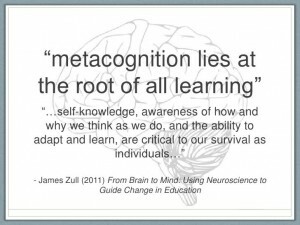 Metacognition is an idea that I have always tried to incorporate in my teaching, as its importance was heavily emphasized and demonstrated during my Master of Teaching (MT) studies at OISE/University of Toronto (both through the way we were taught and the assignments we ourselves did). Since I began teaching ERW several years ago, I have experimented with various ways of incorporating this approach into the course. My semester with WID was especially useful in helping me to become more aware of, and fine-tune, what I was trying to do in the classroom in this respect. 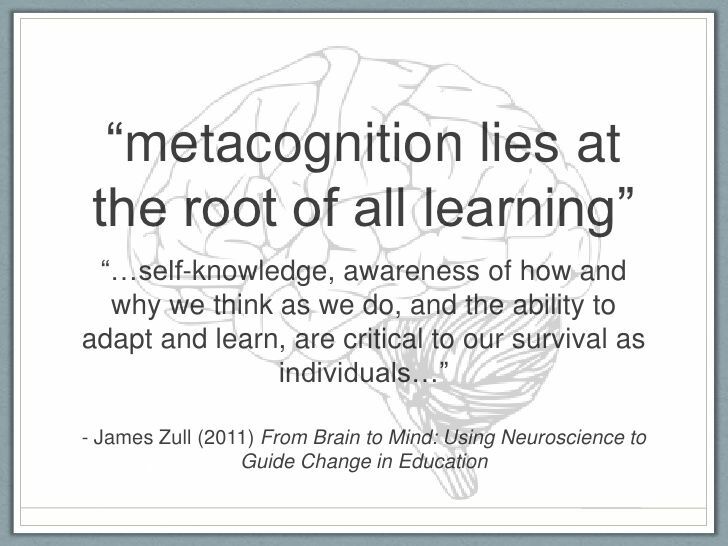 In other words, a case of metacognition about metacognition! One of the challenges of this approach is to figure out how to convey it to students. I’ve tried various ways of reinforcing the concept, but recently found that it was only when I became very explicit about it – writing “metacognition” on the board, explaining it in the context of “higher-order thinking” – that I found students finally got it, and were won over to the importance of the idea in their learning. Lots of analogies to real-life situations also helped (e.g., “You can go the gym and just do a random set of exercises without a plan, or you can assess your needs and goals, and then develop a program with trainer. Option two will probably bring you better results!”). Another challenge is that self-assessment, goal-setting, peer editing, and so on, are ideas and approaches that many students are jaded about, having run into them during their high school studies. Talking about some of the theory behind my pedagogy also helped in this regard, as it acknowledged the students’ increasing maturity, self-awareness, and capacity for abstract, theoretical thinking. The Personal Writer’s Profile is designed to help students understand themselves and their writing in general to set individual goals for gaining specific skills/knowledge in terms of mechanics and basic grammar. I’ve developed this project as a way of dealing with the issue of grammar/mechanics in this course. While I’m aware of the arguments against teaching mechanics overtly, I have found that helping ERW students gain some awareness of simple errors and the knowledge about how to correct them is not a bad thing in itself, and I’m convinced is ultimately empowering. As I explain to my classes, in most cases they are chronically making just a few simple errors that it is easy to become aware of and correct, and doing so will raise the level if their writing and their ability to communicate instantly. As the attached handout explains, the project consists of four steps: goal-setting, study, evaluation, and final self-evaluation. To make it possible for students to work in an individual way (on the five areas they chose), I’ve been experimenting with various on-line mechanics/grammar programs. The last one I used was MacMillan’s LaunchPad Solo, which worked quite well. It was very user-friendly, had excellent videos and other material on the topics, and despite some technical glitches, was well-received. This isn’t an easy project to teach and administer, but I have found students to be quite willing to do it, and happy to have a portion of the course in which they can determine their own very specific, personal goals. The Essay-writing Portfolio is the central essay project around which the course is built (see “assignment-centred” teaching…..), and I hope incorporates many of the concepts and strategies we explored in WID. The project lasts around six weeks in the middle of the semester, and consists of developing a literary essay about a short story studied in class. This is an approach I started using with my English BXE: Nonfiction Writing course, and am now trying to incorporate into all my courses, but especially ERW. After doing this for several years, I’m convinced that the more we can allow students to do multiple drafts, the more they will learn about writing and feel confident and happy about it. While the final product of the assignment is “closed-form” academic writing, it is reached only as a result of a lot of informal, exploratory and often personal writing (especially in the “Critical Responses” students write about class readings, but also in informal, in-class writing that often takes place before or after discussions). Because students are constantly moving between different types of writing, I hope that they build the “genre and rhetorical awareness/flexibility” that Bean so effectively argues is key to writing confidence and success. The biggest change I made was writing my final draft. I wrote it completely differently. I did this because the teacher told us it had to be brilliant and should sound beautiful. So I wrote it as a creative piece of literature. My final draft now sounds like a great essay. I never realized essays were supposed to be so extravagant. Before writing this, all my teachers [were] expecting boring, straightforward 5-paragraph essays. Now I know they can be fun and creative. An important reminder that I took from WID was that, just like our students, we are on a continuous learning path – one in which we should feel engaged, empowered, and have the space to think about our needs, goals, and interests. WID gave me that space, and I can only hope that such opportunities for collegial exchange and professional growth continue to be made available to us. This is the English course students are allocated when they score at the Grade 10 level or lower in the English Placement Test.